This third example of de Havilland’s Wooden Wonder is the first example featured of the most numerous surviving variant, the TT35. This model was a target tug adaption of the B35 – a late production example of the aeroplane which featured an expanded bomb bay. This larger bomb load led to the distinctive bulge underneath the fuselage. This variant of the Mosquito was the final example to see service with the RAF. Following military service many of the airframes took on Target Towing duties. TA634 concludes a look at the three Mosquitos on display at the de Havilland Aircraft Heritage Centre. ‘634 wears the colours of 571 squadron. The airframe was built in 1945 and spent some time at Exeter following conversion, towing targets. After the first airworthy life came to an end in the early 1960s, ‘634 passed into the ownership of the City of Liverpool Corporation. 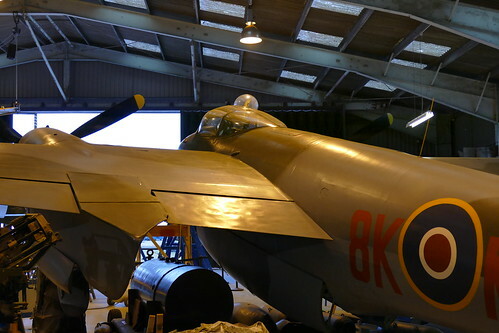 The airframe remained in storage until 1968, when work was carried out to return the Mosquito to flying condition. Like many other examples at the time the reason for the restoration was to take part in the filming of “Mosquito Squadron”. 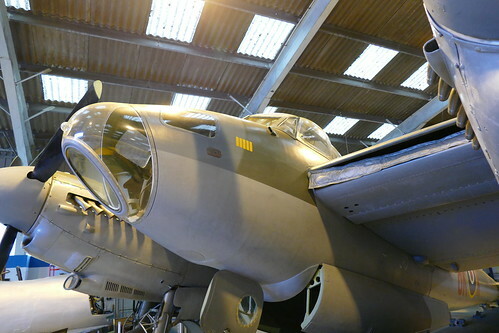 Following this brief second life as a flying airframe, ‘634 moved into the ownership of the then Mosquito Aircraft Museum, now better known as the de Havilland Aircraft Heritage centre, in 1971. Over a 10 year period from 1980 work began to restore the airframe once again, this time for static display as part of the museum. ‘634 was rolled out in the current scheme in October 1990. 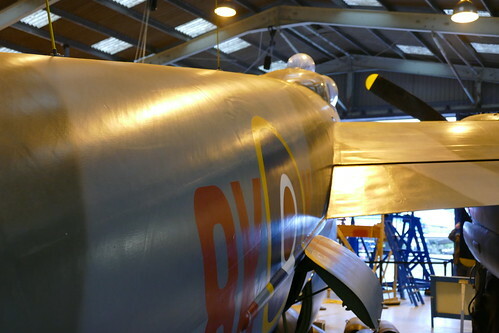 This particular Mosquito was one of the last examples constructed at Hatfield, marking the end of an important era in both the company and nation’s history. It is especially fitting that this aircraft is now on permanent display at London Colney, a site rich with Mosquito history and a wonderful tribute to all things de Havilland. As a matter of passing interest, I flew these ‘pregnant tadpoles’. on 627 Squadron at Woodhall Spa. These Mark IVs were Packard Merlin equipped and were not cleared for carrying a 4,000 lb. bomb. We carried 2 x 1,000lb. target indicators. Hi John, thanks for your comment. That sounds like an incredible experience – I’d love to speak with you more about it if I may. I always enjoy sharing the human stories behind these incredible machines. I am following Your reports on the UK Mosquitos with great interest. I often read that there are no flying examples in UK/Europe and often thinks of the time when I had the great pleasure to see a FLYING Mosquito at an airshow (Shuttleworth Collection) in the late seventies (`78-`79? ), it made 2-3 very low low passes before returning to its base (?). Do You have any idea where “my” Mosquito is located to day and the status if it ?? Hi Claus, thanks for commenting. I suspect that would have been RR299, a TIII Mosquito that was owned and operated by BAE Systems. Sadly the aircraft and crew were lost in an accident in 1996. This aircraft was the last active Mosquito to have flown in the UK.